Covering footwear from antiquity to the present and featuring a dazzling array of historically important examples and designer classics, this title is the definitive guide to shoes – a must-read for students, researchers and all those interested in fashion. With images of more than 200 shoes — many from the shoe collection at Northampton Museums and Art Gallery, England — this lavish volume takes the reader on a glorious journey through many centuries of footwear, on the way showcasing shoes from all around the world. 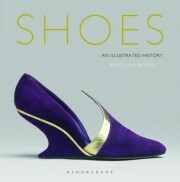 Written by shoe historian Rebecca Shawcross, the book is packed with historical detail putting the rich history of shoe styles, superstitions and traditions in context, and exploring shoes as highly personal objects that evoke a time, place and an emotion. Rebecca Shawcross has been involved with the shoe collection at Northampton Museums — one of the world’s largest collections of shoes and related material – for the last sixteen years. Shawcross has written a number of articles on shoes and has been consulted by leading designers and the media on all aspects of shoe history and styles. This new shoe compendium will raise you to ‘new heights’. Taking the reader on a thrilling shoe odyssey, the work crosses all ground, from the everyday and the emotive, to the extravagant and the spectacular. Erudite and comprehensive, this book sets new standards in exploring the history of footwear. If you love shoes, buy this book! Learn about shoes across the centuries: prehistoric sandals, buskins, slap soles, and shoe designers. An attractive, appealing, informative, and gorgeously illustrated documentation. Rebecca Shawcross knows shoes. My usual beef with most shoe survey books produced in the late 20th century is that they pretty much have all the same shoes in them … [Shoes] has SO much more – so many other pairs of footwear that you just don’t see in the majority of other books of this sort out there. This book is beautifully put together and enormously readable/browsable – a great balance of full color images, historical illustrations & engravings, and meaningful yet not dense text … Shawcross gives equal weight to the progression of the history of footwear itself … as she does to recurring iconic styles and innovations/innovators … Ultimately, this is an exciting new book on a subject I adore, and I highly recommend it. This beautifully illustrated compendium reveals the expertise of Shawcross, curator of the Boot and Shoe Collection (with more than 13,000 pairs, Europe’s largest) at the Northampton Museum and Art Gallery, located in England’s shoe trade center. Covering prehistory to the present, the author provides brief historical introductions for each period and discusses footwear design, types, fashion, manufacture, marketing, superstitions, uses, famous owners and designers, brands, and more … the book would undoubtedly be a keepsake for shoe aficionados … Summing Up: Highly recommended. All levels/libraries. 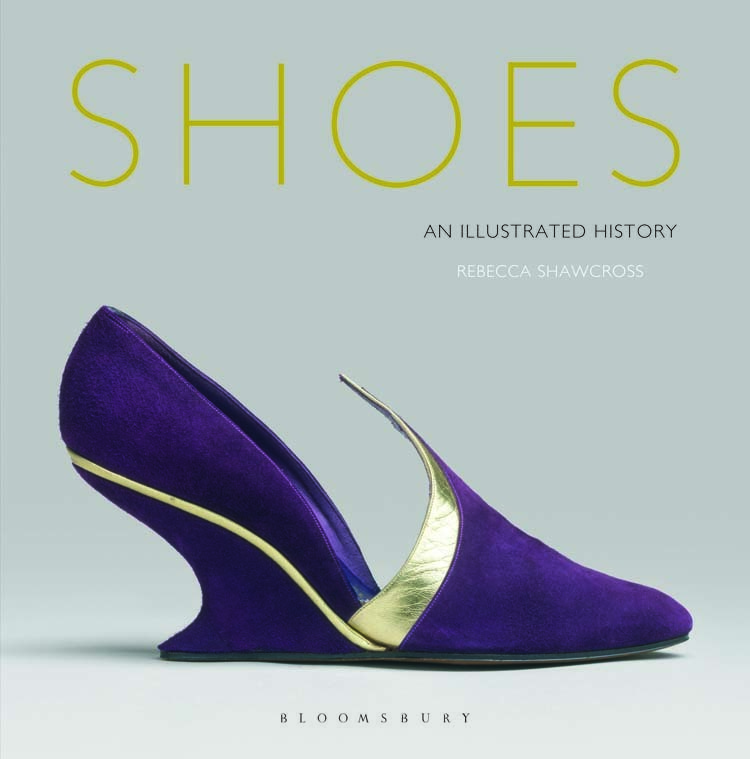 Shoes: An Illustrated History by Rebecca Shawcross shows the human fascination with footwear over millennia … Shawcross knows her stuff. She uses historical documents, paintings, photographs and advertising to show the ongoing development of footwear for both sexes. Shoes: An Illustrated History isn’t just about those things we stuff on our tootsies; there’s Hollywood here, as well as biographies, pop culture, and plenty of history to dip your toes into. And while you’ll find a satisfying amount of narrative, what’s especially appealing are the dozens and dozens of full-color pictures of shoes, including bygone styles perfect for today’s runway, and footwear you’d likely boot to the curb. I think anyone with more than ten pairs of shoes in the closet is missing something if this book isn’t laying next to the bed. For you, Shoes: An Illustrated History is a real kick.